Technology group Wärtsilä has successfully carried out testing of its new autodocking technology. 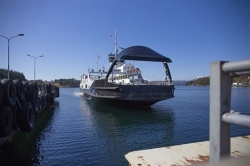 The tests were carried out using Folgefonn, an 83m-long (272ft) hybrid ferry owned by Norwegian operator Norled and fitted with a Wärtsilä wireless charging system. The installation of autodocking on a ferry is a world first. The autodocking tests commenced in January of this year and were completed in April with harbour docking trials. The autodocking project is supported by the Norwegian state-owned Innovasjon Norge (Innovation Norway). The procedure involved activating the system some 2,000m (6,561ft) from the berth while the vessel continued at normal transit speed. The system then performed a gradual slowing of speed, and activated the line-up and docking manoeuvre automatically until the ship was secured at the berth. According to Wärtsilä, at no time during the tests did the captain need to take manual control. When the ship is ready to sail again, the system can be used for the departure procedure in an identical but reverse manner. Full manoeuvring of the vessel, including the steering and propulsion, is automatically controlled by the software. However, manual intervention and control is possible at any time. Norled has made Folgefonn available to Wärtsilä for further development of a number of Wärtsilä Smart Marine products and systems. Among the Wärtsilä technologies already installed and tested are its energy optimisation system, hybrid propulsion system, wireless inductive battery charging and energy storage. The ferry can now be operated with automatic wireless charging, automatic vacuum mooring and automated docking.